September 2018: Congrats to undergraduate, Paty De Anda, on having her research accepted to the BMES 2018 meeting! July 2018: Paty De Anda is awarded first place for her poster at the LS-NSF/AMP program. June 2018: Congrats to SPRL undergraduate Paty De Anda on being selected as a Blair Research Fellow in Bioengineering! May 2018: Dr. Winkelstein has been named the Eduardo D. Glandt Presidential Professor! May 2018: Congrats to Dr. Sijia Zhang on being this year's 2018 Bioengineering Dept recipient of the Solomon R. Pollack award for Excellence in Graduate Bioengineering Research! April 2018: Congrats to SPRL undergraduate Nick Stiansen on being awarded the Second Honorable mention for his team's Senior Design project in this year's Penn Engineering competition! April 2018: Dr. Winkelstein has been elected to be a Councillor in the World Council of Biomechanics. March 2018: Congrats to Meagan Ita on successfully defending her thesis proposal! Congrats on becoming the lab's newest PhD candidate! February 2018: Congrats to SPRL undergraduate Nick Stiansen on being named a 2018 Thouron Award Winner! Well deserved! September 2017: Congrats to Sijia Zhang on successfully defending her PhD thesis! Well done, and all the best as you start your post-doc at UCSF! August 2017: Congrats to Megan Sperry on winning the BMES Design and Research Award this year! A real honor and recognition for her terrific work with TMJ pain and imaging! August 2017: Congrats to SPRL undergraduate Alejandro Villasmil on being named a Noordergraaf Fellow in Penn Bioengineering! May 2017: Congrats to Ya-Hsin Yu for successfully defending her terrific MSE! She returns to Penn Dental for continued education but we look forward to continuing to publish her great work with Rat Grimace Scale over the next year! May 2017: Congrats to undergraduate Jessie Frank on a terrific senior thesis and graduation from Penn BE! March 2017: Sonia Kartha receives Honorable Mention for the NSF Graduate Research Fellowship. Congrats to Sonia on this nice recognition! January 2017: Congrats to graduate student Sijia Zhang on having her paper named as one of the Editors' Choice Papers of JBME, the top 10 papers published in 2016! Congrats on the really nice and well-deserved recognition of your work! December 2016: Congrats to Megan Sperry on successfully defending her thesis proposal - great to have another official PhD candidate in the SPRL! December 2016: Congrats to graduate student Sonia Kartha on winning 3rd place prize for best poster at the Center of Targeted Therapeutics and Translational Nanomedicine Symposium! December 2016: Graduate student Sijia Zhang was awarded a slot on the newly awarded Center for Engineering MechanoBiology as a trainee! Congrats Sijia on this competitive recognition. October 2016: Congrats to SPRL post-doc Timothy Holsgrove on his new position as Lecturer at the University of Exeter. Good Luck Professor! October 2016: Dr. Winkelstein has been elected to the BMES Board of Directors serving 2016-2019. August 2016: Congrats to Sonia Kartha on passing her qualifying exam - another PhD candidate for the SPRL! July 2016: Congrats to SPRL PURM undergraduate, Ethan Zhao, on being named a Rachleff Scholar. July 2016: Congrats to Sonia Kartha on winning 1st place in the 2016 MS Student Paper Competition at the Summer Biomechanics, Bioengineering and Biotransport Conference! April 2016: Sonia Kartha receives Honorable Mention for the NSF Graduate Research Fellowship. Congrats to Sonia on this nice recognition! March 2016: Congrats to Dr. Jenell Smith on being this year's 2016 Bioengineering Dept recipient of the Solomon R. Pollack award for Excellence in Graduate Bioengineering Research! March 2016: Congrats to SPRL alum and later an employee, Ben Bulka, on his new job at Fikst Product Development - we'll miss you Ben! March 2016: Congrats to Sijia on being covered in the Penn News today for her recent publication in Journal of the Royal Society Interface on network science to predict ligament failure. February 2016: Congrats to SPRL undergraduate, Nick Stiansen, on being awarded a slot on the Virgina Tech REU program for the summer of 2016. February 2016: Congrats to PhD student Sijia Zhang on being awarded the Force & Motion Scholarship from AMTI for her research in multi-axis testing! January 2016: Congratulations to SPRL graduate students Sonia Kartha and Megan Sperry on being awarded the 2nd prize for their joint presentation at the 2016 Bioengineering Research Symposium. December 2015: We're happy to be awarded the Cervical Spine Research Society Grant to study a new potential therapy for pain. November 2015: Congrats to Jenell Smith on successfully defending her PhD thesis! Well done, Dr. Smith! August 2015: Congrats to lab undergraduate, Xavier Islam, who has been accepted to the Rachleff Scholars Program. August 2015: Megan Sperry was awarded the competitive Orthopaedic Training Grant to support her thesis studies. Congratulations! July 2015: Congrats to Megan Sperry on passing her qualifying exam - great to have another SPRL PhD candidate! July 2015: Congrats to lab member, Ben Bulka on completing his MSE thesis in SPRL! July 2015: Congrats to Dr. Kras (most recent SPRL PhD) on his new position at Integra! We'll miss you! July 2015: Congratulations to Meagan Ita on passing her qualifying exam and becoming the lab's newest official PhD candidate! June 2015: Congrats to Jenell Smith and Sijia Zhang on winning 1st and 2nd place in the 2015 PhD Student Paper Competition at the SB3 Conference. Congrats! May 2015: Congrats to Sijia Zhang on successfully defending her thesis proposal - another PhD candidate for the SPRL! May 2015: Congrats to SPRL lab resident, Dr. Blythe Philips, on her new job as a ULAR Veterinarian here at PENN! May 2015: Congrats to undergraduate Nina Zhu on her undergraduate graduation from Penn BE! Nina is staying on to finish an MSE next year in Penn Engineering. March 2015: Meagan Ita receives Honorable Mention for the NSF Graduate Research Fellowship. Congrats to Meagan on this well-deserved recognition! February 2015: Congrats to SPRL post-doc Nico Jaumard on his new position as Senior Development Engineer at Zimmer! January 2015: Congratulations to SPRL graduate student Jenell Smith on being awarded the 1st prize for her presentation at the 2015 Bioengineering Research Symposium. November 2014: Our paper "Intra-articular Nerve Growth Factor Initiates Pain and Associated Spinal Neuronal Hyperexcitability from Cervical Joint Pain" to be presented at this year's Cervical Spine Research Society Meeting has been selected as the 3rd Place Research Award Paper by the Cervical Spine Research Society's Research Committee. Congrats to the co-authors, Jeff Kras and Beth Winkelstein! October 2014: Congrats to Jeff Kras on successfully defending his PhD thesis! October 2014: Congrats to Ben Bulka on passing his qualifying exam and officially becoming the lab's newest PhD candidate! September 2014: Nathan Crosby successfully defended his PhD thesis. Congrats Dr. Crosby! September 2014: Congrats to undergraduate, Tim Zhou, on having his research accepted to the BMES 2014 meeting! July 2014: Dr. Winkelstein has been elected as a Fellow in the BMES! She will be recognized at the upcoming society meeting in Fall, 2014. July 2014: Congrats to Jared Zitnay from UMn for winning second place in the 2014 BS Student Paper Competition at the WCB Conference - his co-authors also included SPRL alums Kyle Quinn and Derek Lee! July 2014: Congrats to Jenell Smith for earning competitive support for her thesis by the Orthopaedic Training Grant for another year! June 2014: Dr. Winkelstein's new course in Appropriate Point of Care Diagnostics is featured in the Penn Current! June 2014: Congrats to Kosuke Tanaka for successfully defending his MSE! Kosuke will return to Japan to practice endodontics! 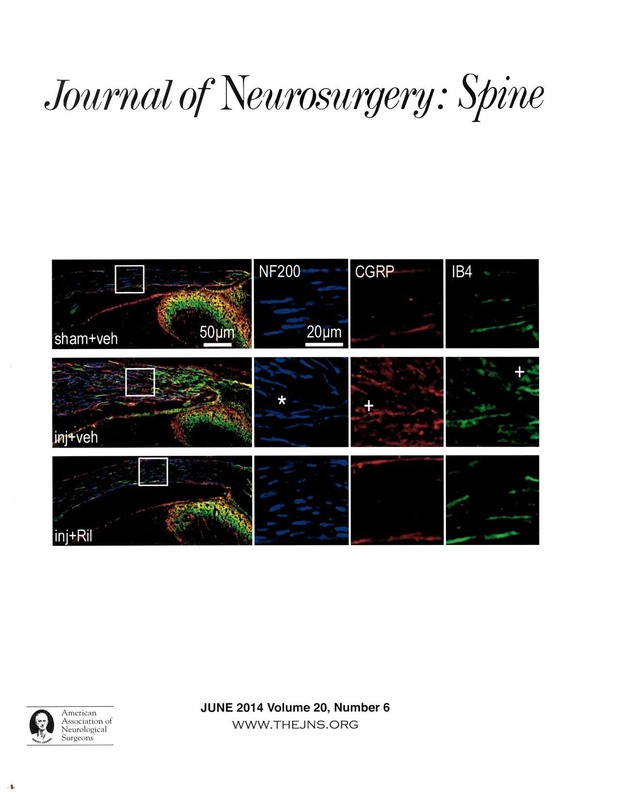 June 2014: Our research is highlighted on the cover of Journal of Neurosurgery - Spine Vol 20, No. 6. Check it out! May 2014: Congrats to undergraduate Taylor Gilliland on her graduation from Penn BE! Taylor will start Medical School at Baylor in the Fall! Fall 2013: Dr. Winkelstein was featured in the Penn Engineering magazine! Sijia Zhang is also pictured in the story on the BE website. November 2013: Sijia Zhang received the 2nd Place Prize in the Best Student Paper Award entitled "The Roles of Mechanical Compression and Chemical Irritation in Regulating Spinal Neuronal Signaling in Painful Cervical Nerve Root Injury." Co-authors on the paper include Dr. Kristen Nicholson, Jenell Smith, Dr. Pete Syre, Taylor Gilliland, and Dr. Winkelstein. Congrats to all! November 2013: Our paper "Riluzole Provides Neuroprotection Against the Development of Axonal Damage and Spinal Hypersensitivity, While Abolishing Radicular Pain" to be presented at this year's CSRS Meeting has been selected as the 1st Place Research Award Paper by the Cervical Spine Research Society's Research Committee. Congrats to the co-authors, Kristen Nicholson, Sijia Zhang and Beth Winkelstein! September 2013: Congrats to lab undergraduate, Timothy Zhou, who has been accepted to the Rachleff Scholars Program. August 2013: Congrats to undergraduate, Nina Zhu, on winning Honorable Mention in the Rachleff Scholars Presentation Competition! July 2013: Congrats to Sijia Zhang on passing her qualifying exam and becoming the lab's newest official PhD candidate! July 2013: Congrats to Nadia Gharbi - the lab's latest MS graduate! July 2013: Kristen Nicholson successfully defended her PhD thesis. Congrats Dr. Nicholson! June 2013: Hassam Baig wins third place in the 2013 Student Paper Competition, Masters Level, at the ASME Summer Bioengineering Conference. Congrats Hassam! Summer 2013: Congrats to SPRL undergraduate, Taylor Gilliland, on being awarded a Littlejohn Summer Research Fellowship from SEAS to conduct her independent research in the lab this summer! April 2013: Dr. Winkelstein is awarded the Ford Motor Company Award for Faculty Advising from Penn Engineering undergraduates. February 2013: Congrats to Jenell Smith on successfully defending her thesis proposal - another PhD candidate for the SPRL! January 2013: Dr. Winkelstein has been elected as a fellow of the American Institute for Medical and Biological Engineering (AIMBE) for the class of 2013. January 2013: Bioengineering undergraduate and Rachleff Scholar, Nina Zhu, has joined the SPRL to do her research project. Welcome and congrats! 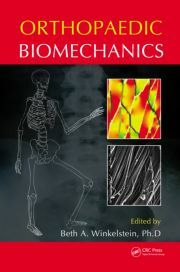 December 2012: Dr. Winkelstein's book Orthopaedic Biomechanics was published. December 2012: Congrats to Neurosurgery resident Pete Syre who was awarded the Resident Research Award at the 24th Annual Pan Philadelphia Neurosurgery Conference. December 2012: Lab alumna Sarah Rothman, PhD will be starting at Merck as a Senior Research Biologist in the Neurodegeneration Division in January 2013. Congrats Sarah! August 2012: Congrats to undergraduate, Taylor Gilliland, on having her research accepted to BMES 2012 meeting! June 2012: Dr. Winkelstein elected as a fellow in the American Society of Mechanical Engineers. May 2012: Congrats to undergraduates Julia Quindlen and Dan Lipschutz on their graduation from Penn BE! Julia will start in the PhD program in BME at UMN in the Fall and Dan will be working for Stryker. Thanks for all of your help over the years! January 2012: Dr. Winkelstein has accepted the position as Co-Editor of the Journal of Biomechanical Engineering. January 2012: Nate Crosby successfully defended his thesis proposal. Congrats to the SPRL's newest PhD candidate! January 2012: Congrats to Derek Lee - the lab's latest MS graduate! January 2012: Dr. Winkelstein is named a Penn Fellow. 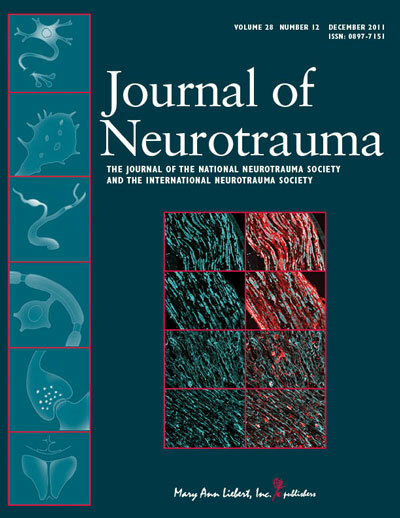 December 2011: Our research is highlighted on the cover of Journal of Neurotrauma Vol 28, No. 12. Check it out! November 2011: Kristen Nicholson and Julia Quindlen are co-recipients of the 2nd Place Prize in the Best Student Paper Award entitled "Development of a Duration Threshold for Modulating Evoked Neuronal Responses After Nerve Root Compression Injury." October 2011: Ling Dong successfully defended her PhD thesis. A job well done, Dr. Dong! August 2011: Congratulations to Josh Black, undergraduate in the lab, whose abstract was selected as a poduim presentation in the Undergraduate Research Competition at the upcoming BMES meeting! August 2011: Dr. La'Toya Latney passed her comp exam. Congrats on this milestone! July 2011: Dr. Winkelstein has been awarded a 21st Century Research Grant from the Cervical Spine Research Society. June 2011: Graduate Student Jenell Smith successfully passed her PhD Qualifying Exam. Congrats on this milestone! May 2011: Dr. Winkelstein is promoted to Full Professor. April 2011: Congrats to SPRL seniors Andrea Barberio, Mike Czubakowski and Beth Green on being awarded the BE Senior Design Award this year. This is a great accomplishment and a terrific way to graduate! Well done! April 2011: Nate Crosby receives Honorable Mention for the NSF Graduate Research Fellowship. Congrats to Nate on this impressive recognition! March 2011: Former graduate student, Kyle Quinn, receives the Solomon R Pollack award for Excellence in Graduate Bioengineering Research given out by the BE Graduate Group. March 2011: Congrats to Jeff Kras for successfully defending his thesis proposal! February 2011: Kristen Nicholson successfully defended her thesis proposal. Congrats to the lab's newest PhD candidate! January 2011: Undergraduate, Joshua Black, mentioned in the Pennsylvania Gazette for his lab research. January 2011: Dr. Winkelstein is featured in an article about Dean Glandt and the Engineering School in Flying Kite. October 2010: Our paper "Macrophage as a Potential Biomarker for Imaging Radicular Pain" to be presented at this year's CSRS Meeting has been selected as the 1st Place Research Award Paper by the Cervical Spine Research Society's Research Committee. Congrats to the co-authors, Christine Weisshaar, Dan Hubbard , Dan Thorek, Andrew Tsourkas and Beth Winkelstein! September 2010: Lab undergraduate Julia Quindlen is off to University of Edinburgh for study abroad semester - Bon Voyage and thanks for your help this summer! July 2010: Kyle Quinn successfully defended his PhD thesis. Congrats to Dr. Quinn! July 2010: Graduate student Nate Crosby successfully passed his PhD Qualifying Exam. Congratulations Nate! April 2010: Kalonda Johnson is awarded a prestigious Graduate Research Fellowship from the National Science Foundation. This prestigious award recognizes and supports outstanding graduate students. Congratulations to Kalonda on this wonderful recognition. December 2009: Dr. Winkelstein was elected to membership in the Cervical Spine Research Society, a multidisciplinary organization that provides a forum for the exchange of ideas and promotes clinical and basic science research of the cervical spine. The CSRS is the recognized authority on diseases of the cervical spine. Dr. Winkelstein is 1 of only 7 active engineers in the society. October 2009: Kyle Quinn's paper in published in the Journal of Biomedical Optics (2009), has been selected for the October issue of the Virtual Journal of Biological Physics Research. The Virtual Journal, which is published by the American Physical Society and the American Institute of Physics, is an edited compilation of articles covering a focused area of frontier research. Nice work Kyle! September 2009: Dr. Joel Bauman was selected by the American Association of Neurological Surgeons to attend the Fundamentals in Spinal Surgery course for Residents to be held in November at the Spine Masters Institute in Burr Ridge, Illinois. September 2009: Jeff Kras and Kristen Nicholson both receive Student Travel Awards from the BMES to offset their travel to the BMES meeting in October. Congrats! June 2009: Ben Guarino is an extra in Transformers 2! June 2009: Dr. Winkelstein has been invited to participate in the 2009 National Academy of Engineering Japan-America Frontiers of Engineering Symposium, which brings together Engineers from both countries to facilitate interdisciplinary transfer of knowledge and methodology that could eventually lead to collaborative networks of engineers from the two countries. June 2009: Kiersten Craig wins third place in the 2009 Student Paper Competition, Bachelor Level, at the ASME Summer Bioengineering Conference. May 2009: Kristen Nicholson receives Honorable Mention for NSF Graduate Research Fellowship. April 2009: Dr. Winkelstein has been appointed as an Associate Editor of the Journal of Biomechanical Engineering. April 2009: Sarah Rothman graduates - Congratulations, Sarah! April 2009: Dr. Joel Bauman, a neurosurgical fellow in the lab, was awarded a Neurosurgery Research & Education Foundation Fellowship for Neurosurgery Residents from the AANS. This is a 1 year grant to study motion preservation and stabilization in the post-laminectomy cervical spine. April 2009: Dr. Winkelstein has been awarded a 5-year RO1 grant from the National Institutes of Health to study the nociceptive mechanisms of whiplash injury. January 2009: Dr. Winkelstein has been invited to serve on the Associate Editorial Board of the journal Spine. December 2008: Katie Lee graduates - congratulations, Katie! November 2008: Dan Hubbard, Kyle Quinn, and Joey Martinez are co-recipients of the Best Student Paper Award entitled "The Role of Graded Nerve Root Compression on Axonal Damage, Neuropeptide Changes, and Pain-Related Behaviors" at the 52nd Stapp Car Crash Conference. October 2008: Sarah Rothman receives a post-doctoral fellowship award from the National Research Council. August 2008: Joey Martinez is awarded second place for his poster "DREAM's Role in Chronic Pain Following Spinal Injury" at the LS-NSF/AMP program. June 2008: Vandana Sood is awarded a Blair Fellowship to support her Independent Study work in Fall 2008. Her proposal was one of only four selected and provides support for her research. June 2008: Dr. Winkelstein has been invited to serve as Co-Chair for the Orthopedics & Rehab Engineering Track of the upcoming BMES Annual Meeting in 2009. May 2008: Dr. Winkelstein has been invited to serve on the YC Fung Young Investigator Award Committee for the ASME-Bioengineering Division. Her appointment is effective July 1, 2008, for a three year term. March 2008: Dan Hubbard is awarded the Solomon R. Pollack award for Excellence in Graduate Bioengineering Research. October 2007: Kyle Quinn, Katie Lee, Chidi Ahaghotu, and Beth Winkelstein's paper receives third place in the student paper competition at the 2007 Stapp Car Crash Conference. September 2007: Kyle Quinn is awarded the AAAM Endowment Student Grant. August 2007: Liz Hines wins second place in the poster competition at the NSF/LSAMP banquet. June 2007: Ling Dong receives honorable mention at ASME Summer Bioengineering Conference. January 2007: Dr. Winkelstein is invited to serve as a member of the Stapp Advisory Committee. Fall 2006: Dr. Winkelstein and the SPRL are featured in the Penn Engineering News magazine. September 2006: Ling Dong is awarded a fellowship on the BE Department's GAANN training grant. August 2006: The lab moves into the new Bioengineering building: Skirkanich Hall. August 2006: Liz Hines wins first place in the presentation competition at the NSF/LSAMP banquet.